For my final few videos of 2018 and to finish up the inaugural year of my YouTube channel, I checked something off my video-making bucket list! I took Mr. Snail Mail Superstar on an overnight adventure to one of my favorite places in the whole world, Treehouse Point. We stayed in the Treehouse called “Nest.” I used the quiet evening away for a mini letter writing retreat. I wrote 16 pieces of mail, addressed to two countries and nine US States. I also took some time to shoot some photos of my favorite cozy items from our brick & mortar! Treehouse Point, located in a forest beside the Raging River in Issaquah, Washington is a rustic bed and breakfast, featuring six hand- crafted treehouses. 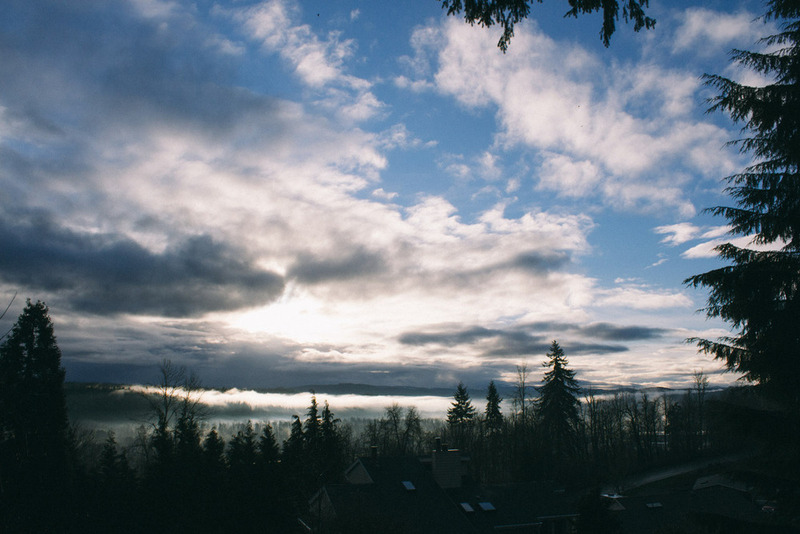 It’s the perfect place to turn off technology, escape everyday stress, and enjoy the rejuvenating powers of the PNW. Treehouse craftsman, Pete Nelson and his wife, Judy, share a vision of connecting people through personal encounters with the trees and nature. You may recognize their names from the popular Animal Planet TV show, Treehouse Masters! This video is Part 1 of 4 in a series! The other parts are linked below. In this segment, I’m leaving Seattle in the pouring rain, arriving at Treehouse Point, giving you a tour of the “Nest” treehouse and talking about the greeting card collaboration I did with the lovely folks from Treehouse Point. In this segment, I’m opening my mail and reading reading some holiday cards and postcards that I’ve received recently. 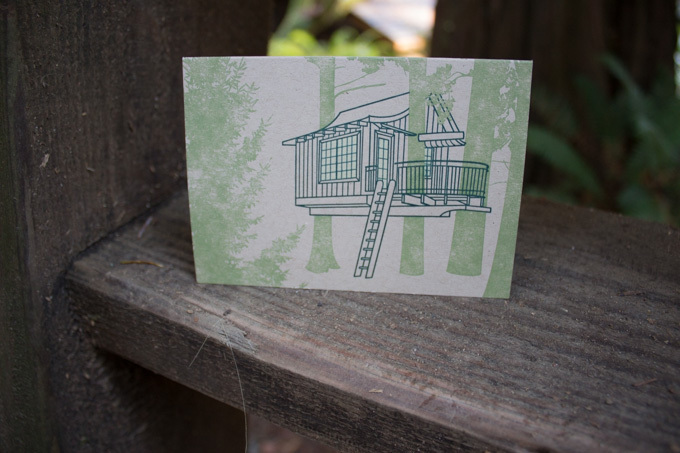 In this segment, I’m writing letters and cards with my favorite fountain pen and using my Snail Mail Superstar wax seal… all in a treehouse! I wanted this video to be a peaceful escape, so I didn’t include any clips of me talking (you’re welcome), and left all the great ASMR letter writing sounds in there. I hope you love it! In this segment, I’m taking you with me on my morning walk around Treehouse Point to show you the other beautiful treehouses and listen to the roar of the Roaring River. I’m also sharing some thoughts on progress and milestones and reflecting on where my life was at 5 years ago, the last time I visited Treehouse Point. Last month, we exhibited at the National Stationery Show for our first time, and it was incredible. We've been busy printing cards, filling orders and following up with the amazing people we met at the show. Here's the recap of all we learned, what we'll do differently next time, and all the things I need to gush about. Buyers = Friends The people who placed orders with us were kindred spirits. They laughed at the humorous cards, awww'd at the sweet cards, and were incredibly encouraging. Meeting our buyers face to face was a wonderful reminder that these people are our friends! We enjoyed meeting them, talking with them and hearing their thoughts. I want to keep remembering that through the year. It's hard to remember to follow up with a business contact, but easy to remember to check in with a friend! Follow your gut. There were a lot of things I was worried about right before the show. Will buyers reject our non-standard card sizes? Will black envelopes be a deal breaker? Will anyone order? Will our work be too different from everything else at the show? (I had moments of second guessing everything I've ever done.) But at the show, the buyers' comments were overwhelmingly positive. Not a single person questioned sizes, envelope colors, or any of the other things I had stressed about. They were super encouraging about our low-tech image making and print methods, and our line's simplicity and masculine appeal. Many of our buyers were male or buying from our line for their male customers. I'm not a dude, but I am married to a dude. And I'm really not a "girly" girl. The stationery industry can be very feminine, and I was worried we'd stick out in a bad way. But it was really nice to hear from buyer after buyer that our work is a welcome change. So I suppose the lesson here is: You followed your gut when you made these choices in the first place. Stick to those decisions. Consider them good ones until you hear differently. Ignore the blinding pre-show panic. I also packed two of pretty much everything. In different bags. And had a back-up box at the studio, just in case. Something will go wrong, and planning ahead (in obsessive detail) gave me greater confidence to know I could tackle most problems as they came up. You need a helper. Brad came to New York with me, and it was incredibly helpful to have someone on hand to help with set-up, bring me coffee, watch the booth while I went to the bathroom, and for general moral support. I can't imagine tackling the show without my right hand man. Solo booth. Exhibiting with Ladies of Letterpress was absolutely the right choice for this year. It gave me a show under my belt, lots of lessons learned, and the validation that this whole tradeshow thing is a good idea for us. But next year, we're planning to tackle our own booth! Brad and I spent time before the last day of the show walking around and looking at locations, booth sizes, etc. We've got a lot of exciting ideas! Shoes. I am on an epic quest to find attractive, comfortable shoes for next year's show. I made some pretty terrible shoe choices for this year. Standing in one place from 10 am to 6 pm for several days is rough. I didn't have room for a chair, and Vans are a bad choice for long term standing. (Be they cute and chambray or not!) We ended up taking a late night teary-eyed (on my part) walk to a Manhattan Kmart for Dr. Scholl's inserts. Your cute and comfortable shoe suggestions are welcomed! Sit. We saw several booths with a cocktail height table/bar, and a cute stool. This is genius. You're up high enough to not look like a slacker, but you also get to take a load off every once in a while. Genius. Eat. Our intention was to go grocery shopping on the night we got into town, and to pack lunches, snacks, etc. for during the show. But our flight was delayed 5 hours, and it was midnight and POURING when we arrived in New York, so that didn't happen. Decent food is hard to come by in the Javits, and will cost you approximately your firstborn child. We were warned, but didn't have a ton of other options. I didn't take very many food breaks during the show, and that's just not a great idea for health. But it seemed like every time I went to take a break, someone would come to place an order or ask questions. Brad did a great job helping, but I wanted to be there. I think the solution for next year is a stash of small, hearty snacks that can be eaten quickly while hiding around the corner. More gift items! Bigger line! Keep going! I have so many ideas. So many. Notebooks full of ideas ranging from impossibly crazy to simple. This coming year we will continue to focus on growing our selection of items. We've got a whole booth to fill! Instagram: awesome. I met so many people at the show who I'd been chatting with on Instagram for months beforehand. It felt like a giant reunion with all my best friends from the internet. So many hugs and high fives. We met fellow designers and printers, Seattleites, and store owners/buyers who we've connected with on Instagram. We picked up a huge quantity of followers at the show (using #nss2014), and several people mentioned that they saw us on Instagram and made a point to find us at the show. Social media win! Our Ladies of Letterpress neighbors: amazing. We spent several days in close quarters with the other ladies o' letterpress, and they were nothing but delightful. It was really fun to experience the show with so many others who were also debuting. We lent each other tools and tape, watched booths during potty breaks, and talked non-stop. I miss them! The weather: perfection. After the first night's crazy rain, the rest of the trip was awesome. It was sunny but still cool, gorgeous every time we went outside. We didn't get much time outside, but it was really nice to walk out of Javits and see sunshine. We filled our free time in New York as full as we could. We caught up with old friends, saw some sights, ate delicious food, and enjoyed the city every moment we had. New York and I have reached a decision. We like each other. It's official. Ladies of Letterpress We exhibited in the Ladies of Letterpress shared booth with 13 other businesses. Constellation & Co. had a 5 feet x 8 feet section of the booth, and all of the businesses shared the costs of the booth, carpeting, walls, lighting, some advertising, etc. We were located in the 2400 aisle, all the way at the end. It would have been a terrible location, except that our booth was giant and pretty darn inviting. It seemed like buyers were making it to us, regardless of the location. If you're a female letterpress printer, join Ladies of Letterpress. (Because duh.) And if you're interested in exhibiting at NSS, this is an amazing way to start. It's significantly less expensive than having your own booth, and it gives you a chance to get your name out there and learn all those first tradeshow lessons with a smaller financial investment. New Stores! We walked away from the show with 11 new stores in 10 new cities! My goal was 10 orders, so I really can't complain! (For a full list of our stockists, check out our stores page.) You can now buy C&Co. products in 15 US states and 3 Canadian provinces! Our little business is growing, and we're so excited to see what comes next. Top 5 NSS best sellers: 1. You & Me Card - I expected this. But it also tied with: 2. Bitterness Card - I did not expect this! (Non-standard size, and a black envelope. Who knew!) 3. Independence, Sweet Independence - Another surprise! A lot of buyers mentioned that the summer patriotic holidays are hard to buy for. 4. Library Cards, Overdue Bday & Page Turner - This was actually our only birthday card on the wall. I know, I know! I'm working on it.5. Chipboard Postcard Bundles - Their simplicity and open-ended creativity were attractive to our buyers! We stayed in an Airbnb apartment a few blocks away from Javits. It was so convenient to have a walking distance place to stay, and it was really relaxing when we got home every night. Plus, it ended up costing less than most hotels. Hopefully the Airbnb hoopla in New York gets settled before next year. We plan to rent the same place again if possible! The photo above is the view from the apartment building's rooftop deck. There's nothing in the world like waking up to see the sun rise over Manhattan! We spent 9 months preparing for the show, and it feels like we've been preparing for it since day one of C&Co. (So I suppose it deserves this crazy long blog post.) During the show, I sustained a level of enthusiasm and excitement that was just ridiculous. It was awesome to see the booths of companies I've looked up to for years, to meet SO MANY amazing people, and to write orders for incredible stores. It never got old. I loved it, every second. (If you don't ask my feet.) It was a joyful, wonderful, life changing couple of days. I cried like a baby when we walked away from the Javits on the last day. The show was 100% wonderful for us. There's been a lot of conversations in the industry about cost, show size, etc. - but from the eyes of this first timer, there's nothing like the National Stationery Show. Can't wait for 2015. On the way home from NSS, we took a detour down to Florida to see Brad's baby sister get married! Tomorrow is the big day. We're both in the wedding party, and we're so happy to get to be apart of such a sweet family occasion. We had the pleasure of designing and printing Robyn & Alex's wedding invites a few months ago. The wedding has a travel and globe theme, which made the project way too much fun to work on. The compass rose featured on the invites is a graphic translation of an image from a Rand McNally atlas. Pretty fitting, given our family name! Each envelope was lined with a different vintage map. We also worked on some really fun day-of pieces, which I'll save for a follow up post when we get home. See you back in Seattle, friends! We love adventures. We love exploring new places, wandering off the beaten path, and learning more about the world we live in. Equipped with our DSLR, we created the adventure blog to document the places and people we encounter and the memories we create. We've lived in Washington State for 5 years and we've only scratched the surface exploring its many unique and amazing places. 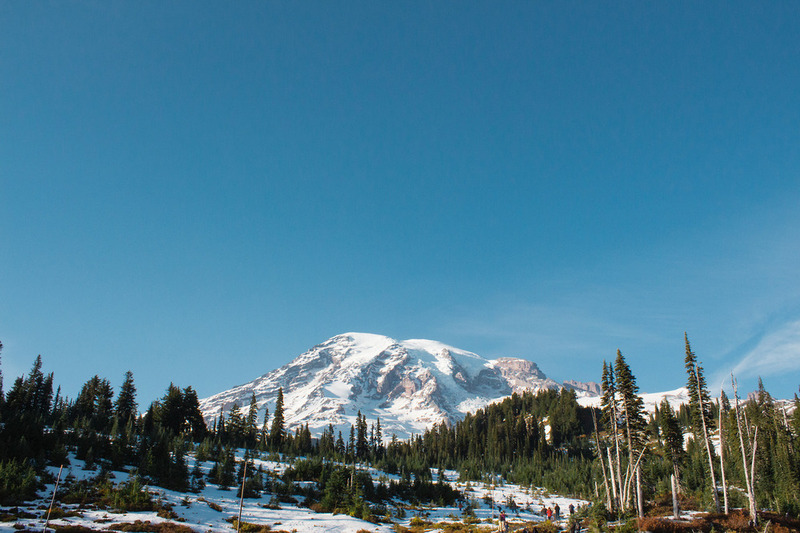 On the blog you'll find our travels in Washington, across the USA and Canada. From California to New York to Florida. Check out the blog at http://adventures.constellationco.com/ or follow us on Tumblr. The view from Sara's parents' house. We visited New York for the first time in October, and I've put off writing about it for too long. It was just... so much. It delighted and overwhelmed me in every way. It fulfilled lifelong dreams and pushed against lifelong fears. I'll be there again in five weeks, and i've been thinking about it a ton. So I suppose it's time to write. If you've been following along with the blog, you know: We travelled to New York for Brooklyn Beta (read Brad's recap post here), visited Bowne & Co. (recap post here), and that I have a major Newsies obsession (read about that silliness here). I've put off writing this recap for many reasons, but here are a few. I'm 27 years old, from a small town in Florida, and I've spent my whole life imagining New York. But when it comes to travel, I'm more like Karl Pilkington than I'd like to admit. (If you haven't seen An Idiot Abroad, go watch it right now.) I'm easily overwhelmed by large groups of people, passionately guarded about my personal space, and I have a terrible sense of direction. (I can't manage using the Seattle bus system. I get lost every time.) I'm neither a particularly good writer, nor do I think my experience was particularly unique. It feels so silly to share what was (to me) a life altering experience, but what is (to many) just daily life. But it was life altering, and as such it should be documented. I've had six months to think about it, so here are the highlights. We stayed in Brooklyn, and travelled there with our friends Hannah and Perry. Our apartment was in a neighborhood that was an amazing picture of life in New York. The taxi ride from the airport blew my mind. There were children everywhere, riding bikes and playing in the street. Every block felt like a different country. I felt like I was seeing more people during that taxi ride than I'd seen in my whole life. I've lived in downtown Seattle, but it didn't feel like this. This was like seeing people's lives, lived out in plain view. They looked at home. And amongst it, I felt impossibly small and out of place. When we got to the Airbnb apartment we'd rented, I wasn't sure how I'd build up the courage to leave it. It was all so big, so different. And I was so terrified. But in the light of day, I was able to embrace the adventure. There was so much to see and experience. To be 100% honest, I'd never realized how very homogenous my life has looked until I walked around Brooklyn. I know about just a tiny slice of the world, and it's left me hungry to know more. On my last full day of the trip, I was caught up in a wind of insanity or inspiration (yet to be decided) and set off on my own to attempt getting a seat to see Newsies in the ticket lottery. I've loved Newsies for as long as I can remember. (The fact that my first trip to New York coincided with the shockingly unexpected broadway incarnation of my obscure favorite film? The irony isn't lost on me.) However, the task required taking the subway alone to Times Square, finding the theater, getting there at a specific time, finding an ATM, and actually lucking into a ticket. I got on the subway, thought I was going the wrong way, got off the subway, realized I was right the first time, and got back on. I found the theater and marched right up (wearing my "newsie" hat) and put my name into the lottery. The city of New York itself must have known I needed this, that I would fall in a crying heap on the sidewalk if it didn't happen... and I got a ticket. I triumphantly took that ticket and set off to kill the two hours before the show started. I did some shopping at Muji, got coffee at Dean & Deluca and watched people out the window while I wrote letters to people at home. It was exactly what I needed. I'd been fearful, worried, and overwhelmed. (Not just about New York, but about everything in my life.) But suddenly, the city felt like a friend. My seat for Newsies was in the first row. I bought Newsies merch (of course), and took my seat next to a lovely elderly couple that wanted to know all about my life. As the first song started, my eyes filled with tears. It was a perfect day, a perfect moment. It was all my fears about life melting away in a hopeful new era. As they broke into Carrying the Banner, I couldn't help but laugh. It was just so perfect. All of it. Seeing a broadway play, by myself, in the middle of the day. My grandma Jean loved the theater, and had always told me about the times she'd seen plays in New York. She's been gone a long time, but I felt like I was getting to see this with her. I felt like life was just beginning, an adventure I couldn't possibly imagine, sweeter and better than I'd hoped. I didn't think that this was about that, but I find myself here now and must follow through. This first trip to New York marked over a year of infertility for us. A year of waiting and hoping and putting off planning and doing. There's so much more to all of this, but the things I realized in New York were the culmination of a year of heartache. Infertility had turned me into a fretful, worried person. Someone who was paralyzed by fear. There was lots of growth in that year, but equal parts fear. And as I write this, we're closer to two years. I left New York on a train. Brad said goodbye to me at Penn Station, and I cried. It was just a few days apart, but time alone with my thoughts was still scary. But I got on a train and crossed many states between New York and Washington D.C., to arrive at Paper Camp and be ushered into a brand new era of my life. Since October, so many things have changed. I've made plans. Lots of plans! I've made decisions and stopped waiting for my life to start. I've embraced that life - this life right now - is an adventure. Next month, we'll arrive in New York again for the National Stationery Show. Since that first trip, Hannah and Perry have relocated to New York. I'm so excited to see them, to experience their new life there! I'm so excited to reconnect with friends from Paper Camp and meet new friends. The stationery industry has completely blown my mind. It's real community, supportive and caring. I'm excited to plant my feet solidly in this new era of life, to say "We're here!" to the world, and see what happens next. Just before leaving New York on the train, Brad and I walked the High Line. We came to the end, and saw the Javits Center (the location of the Stationery Show) off in the distance. I've come back to that moment in my thoughts often these past six months. It's a huge next step towards the dreams i've had for life and business. It's a crossroads. Let's tackle it together, friends. Let's raise a glass to whatever comes next... to the grand adventure of life. Hello friends, it's been awhile. It's about time for a giant update, so here goes! I've been busy preparing for NSS, but it's been more of a fun-busy than a stressed-busy. It's been the perfect opportunity to design and print all new branded pieces, dream up crazy giveaways, and focus on who we are as a company. It's been torture not to Instagram/tweet/blog/shout from the rooftops about the fun new things I've been working on. But I'm determined to keep things secret until just before the show! We're really excited to be back in New York for the show. It's a special city, and one I'm happy to have a yearly excuse to visit. I don't have too many expectations for the show (or at least I'm trying not to), but we're setting a small new stockist goal and planning to celebrate it with a nice dinner. Any suggestions for where we should go? I know I gushed about it in the Fall, but I want to reiterate how important Paper Camp and the Tradeshow Bootcamp community have been in this preparation season. I was a mess thinking about NSS before Paper Camp, but with my binder, my new friends, and the massive load of knowledge I stuffed into my carry-on when coming home... I'm feeling confident and excited. Katie, the founder of Tradeshow Bootcamp, is offering a full scholarship to the next Paper Camp this September in Los Angeles! You can apply here. Don't hesitate, just do it. You won't regret it! We've done five SideTour workshops so far, and they have been absolutely wonderful. It's a joy to welcome new friends into the studio, share my knowledge and see their eyes light up at the chance to create. I learned a ton about printing history in preparation, and can now share 500+ years of history from memory (with a few notes here and there). Feel free to quiz me! It's been really fun to let my nerd flag fly. One of the biggest surprises from the SideTour workshops have been the kids. We've had a few kids in the 10-14 age group attend, and their enthusiasm is incredible. It's really gotten me thinking. I love teaching, love kids, and love seeing the craft of hand printing passed on to the next generation. Still brainstorming on what to do with all of that, but it's on my mind. I'm looking for a freelance letterpress printer to add to the family. I do all our printing in-house, and I adore it. But the downside of being 100% hand-fed and treadle-operated is that sometimes things get busy and I am 100% exhausted. It would be incredibly helpful to have someone to bring in during busy seasons. It's a paid (hourly) position in our Pioneer Square, Seattle studio. I'm looking for someone who is experienced on platen presses, flexible for scheduling and fun to be around. Please pass this info along to anyone you think may be interested. Please send a resume & print samples to hello@constellationco.com. I'm not looking for an intern at the moment, so experienced applicants only please! We spent time at Treehouse Point in November, and it was magical. I've been saving these photos until I'd found just the right words to write about the trip, but sometimes pictures really do say all there is to say. Take home your own can't-be-described treehouse moment with our series of cards and books. A couple weeks ago (it's been so busy since we got back!) we spent time in San Francisco for Renegade Craft Fair and a long overdue "just the two of us" vacation. It was our first time in California, so we took a road trip down the coast to see as much as we could. It was the most wonderful trip. We had lots of adventures, saw the sights, ate tons of great food, did some shopping... SF took really good care of us. Here are some of our favorite things. Nopalito - Some friends who live in SF suggested Nopalito, so we wandered over there wearily after the first day of Renegade. It was an hour plus wait for a table, so we took our orders to go. We were so glad that we did, because it was the best Mexican food we'd ever had, bar none. Seattle has a lot of great food, but Mexican is not one of our strong points. This was such a pleasure to eat. Green Chile Kitchen - More great Mexican! We ate here for lunch, and it was amazing. Super yummy food. And Horchata is delicious. Who knew? Magnolia Gastropub & Brewery - We live in the Magnolia neighborhood of Seattle (and we love it), so we just had to give SF's Magnolia a try. Brad had a great beer, I drank a lovely pomegranate cider, and their bacon wrapped, goat cheese filled dates blew our minds. We liked it so much, we took home a souvenir glass. Tartine - On our road trip, every side of the road attraction had a sign that said "world famous." Most of those things were really not famous, and really not awesome. But let me tell you, Tartine is both world famous AND really awesome. I'm going to be dreaming about those pastries for awhile. Bi-Rite Creamery - Awesome ice cream. I had brown sugar with ginger caramel swirl, and it was delightful. Lou's Cafe - We completely stumbled onto Lou's. We were starving and in a a part of the city we knew nothing about, so we were so excited when it was incredible. Seriously good sandwiches. Ferry Building - We went pretty early in the morning, so we didn't get to partake in any of the savory options, but we had two lovely cups of Blue Bottle Coffee and the best french macaroons i've ever had from Miette. Four Barrel Coffee - Our favorite in SF. Delicious coffee and amazing interior design. So good. Super 7 and Kid Robot - Nerdy goodness. We bought a few fun things. Goorin Bros. Hat Shop - They've been around since 1895, making super gorgeous hats! I wanted everything, of course. Valencia Street - We absolutely loved spending time browsing the shops up and down Valencia. We didn't want to leave. Paxton Gate - Taxidermy, plants, oddities... it's amazing. Taylor Stitch - Gorgeous interior, beautiful custom made clothes. Rad. The Curiosity Shoppe - Carries our items from time to time! Perfectly curated shop. Everything has a perfect place. Very cool. 826 Valencia - This is a pirate themed shoppe in the same network as Seattle's Greenwood Space Travel Supply Co. Super fun inside and all the proceeds go to writing workshops for kids! Union Street Papery - Gorgeous hand painted typography on the walls leading up to the shop, and a mind blowing selection of paper goods. Heath Ceramics - Can we trade in all of our dishes for Heath beauties? Please? Golden Gate Park - I have a total obsession with bison, so we made a bee line for the Bison paddock. Such sweet creatures! Sutro Baths - We were really impressed by these oceanside ruins of a late 1800's, early 1900's marvel. Gorgeous views and super interesting history. Pier 39 - We were trying to avoid the super touristy things in SF, but Pier 39 has SEA LIONS on the docks, all the time. And they are lazy and cute. I loved them. Pier 45 - Has a warship and a submarine that are cool to look at from the outside but expensive to tour. We passed on the tour, but walking over there, we found the Pier 45 Coin Arcade or "Musee Mecanique" - which is a total gem. We were really glad we had quarters! Palace of Fine Arts - A crazy beautiful place that feels like it shouldn't exist. Fun to walk around with a cup of coffee. Arion Press and M&H Type - This deserves its own blog post, which will be forthcoming (hopefully, if I ever catch up). They only do tours Thursdays at 3:00, but it is a sight to behold. This is what printer's heaven looks like. INSANE. They are still casting printer's type for sale - we're gearing up to order a bunch. So exciting and unexpected. I can't overstate how much fun we had. I've got a lot more to share (like how amazing our fellow Renegade sellers were and all the fun things we bought), but they'll have to wait until I catch up on client work a little more.